The spreading proliferation of Class D amps creates a challenge when connecting a REL subwoofer using our High Level Connection. The proliferations is especially common in home theater systems where amp designers are attracted to compact circuit boards and cool running designs in multi-channel amps. Why? Don’t they just hook up like usual and you connect the red and yellow leads to the hot binding posts and black to ground? In a word, “No” and this has nothing to do with REL and everything to do with how most Class D amps are designed. For whatever reason, the vast majority of Class D amps do not reference their Black speaker return terminals to ground, a convention that has been in place pretty much since audio was created. Instead, most Class D amps reference to 10-15 volts ABOVE ground. Why does this matter? Because REL’s have always used earth ground as their reference point. This is done for safety’s sake. Therefore, connecting a Class D amp to a REL that sinks to ground like most amps for the past 70 years creates; 1) a significant current load resulting in heat and eventual damage to the REL (occasionally the main amp, but usually the REL’s input stage) and 2) since the Class D amp is not referenced to ground, it may create hum. EASY SOLUTION: Always float the ground on the REL High Level when used with Class D amps. Correct, do NOT connect the Black ground wire on the REL High Level Cable. Wait, won’t it hum? In about 70% of the cases, it won’t as the system is obtaining ground through other connections. 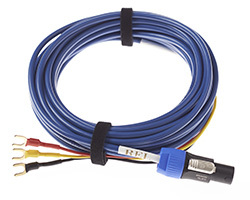 But here’s the trick (and it works for 2-channel systems too, so even if you’re a hair shirt 2-channel guy, you will need to memorize this trick and use it) Connect a .1/LFE cable. Yes, a long RCA-RCA cable connected between an unused RCA connector on the rear panel of the preamp/processor/receiver and the REL’s .1/LFE input RCA will complete signal ground and eliminate hum. Theater: Now, it’s obvious that you’ll connect a .1/LFE cable for theater anyway so this is no big deal, but it IS CRITICAL that you not connect the Black ground lead to the Black binding post on the rear of your amp otherwise you will create aground loop and quite possibly blow up the planet while you’re at it. 2-Channel: Seriously? I hook up a .1/LFE cable for 2-channel, why? Relax, all we are using the .1/LFE cable for is its ground connection to the signal ground bus that is present on the vast majority of pre-pro’s and receivers. You will not be sending an audio signal through this cable, just think of it is an RCA ground cable. There is one final thing to check for on a 2-channel system; please make sure the REL’s .1/LFE Volume control is turned all the way DOWN. Again, we are not trying to send audio through this so we need to ensure we are not accidentally adding weirdly filtered (for 2-channel) bass to our dedicated High Level Connection. There you have it, a simple fix for still being able to use the oh-so-cool and amazing sounding REL High Level Connection with all those new Class D amps.